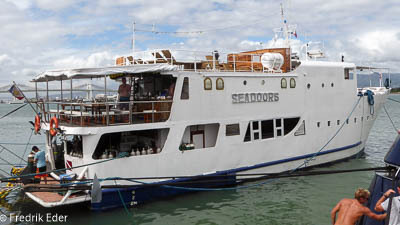 When we arrived in Cebu we were supposed to be picked up at the pier by the liveaboard (Seadoors). But when we arrived we could not find anyone picking us up. Because of fear for terrorism during a festival in Cebu, the government had turned off all cell phone services, so we had no way of contacting the liveaboard. We waited for two hours, before we decided to take a taxi to where Fredrik thought he had read the boat were leaving from. We were very happy when we saw the boat in the harbor. Phew! We boarded the boat and were welcomed by a French divemaster that had been on the boat for 4 months. He was the only one of the crew that were decent in English. On the boat we were only 9 guests, 4 French (that did not speak much English), two Australians, one guy from the UK and the two of us. We had a short briefing and were told that we would not leave the dock until 8 or 9 PM. The trip to the first dive site did take longer than planned because we had had more head wind than expected, so we got in the water just before 8 AM. This spot should be one of the highlights on the trip, because it was famous for it’s rare thresher sharks. The two dives we had here were kind of useless, since we arrived after the day boats arriving from the nearby island Malapascua and all the sharks were scared off. Luckily we went back a few days later. We had a cabin in the bow of the boat below deck. We had two problems there, a leaking air condition that resulted in a lot of wet belongings. Fortunately we noticed before anything was ruined. The other problem was that we were very close to the anchor, so we were often woken up (almost jumping out of the bed) at all hours. The rest of the boat was ok, but quite small, so we couldn’t really stay up late without bothering people who was trying to sleep. That was probably a good thing though, since they managed to run out of beer half way through the trip, even with a half-full boat and not very social people. 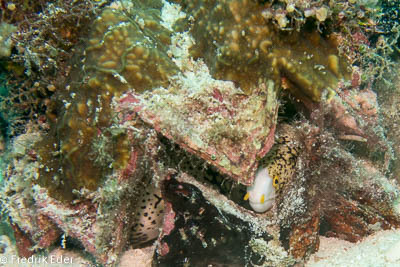 It was quite obvious that the divemaster was not used to run the boat on his own. We hardly got any information, often arrived late to dive sites, didn’t know when to get up in the morning and how much time we had to relax between dives. The rest of the crew was very shy and didn’t speak much English, so except from when we were getting in and out of the water, we didn’t see them much. We did see them dumping trash in the water though. Not good! Originally 20 dives was planned, but because of some bad weather, but mainly very bad planning, we ended up doing just 15-17. A lot of the dives were very deep, and on most of them we didn’t really see very much. Even the OW divers were going much deeper than they were certified for. We had a few days a bit further north before we were supposed to go southeast to Southern Leyte and search for whale sharks. but because of bad seamanship and and an anchor stuck on 60 meters, we were not able to go. After a vote between the passengers, we ended up going to Cabilao island between Bohol and Cebu instead. The diving there was good, but this was not what we had planned for so we were disappointed, and the mood on the boat was not the best. 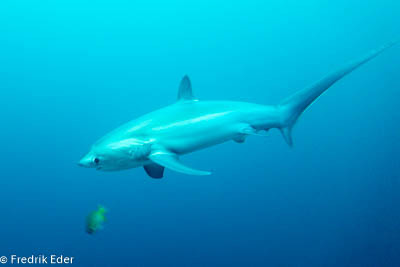 The highlight of the trip was definitely the thresher sharks at Monad Shoal. On our third dive there, we stayed at 30 meters for most of the dive, laying still and hardly breathing, to not scare them off. A few of them got really close, and it was quite spectacular. On Gato Island we went through a cave, and saw lots of sharks and moray eels. 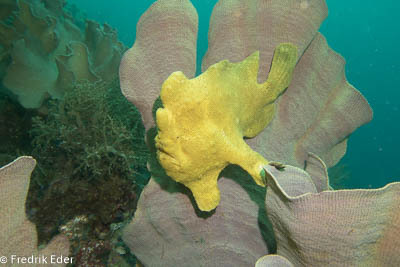 We also did a night dive there where we saw a cat shark, frog fish, flamboyant cuttlefish and a sea horse. At Bullshark reef (Maripipi) we saw 2 Pygmy seahorses, which was pretty cool. We looked for hammerheads around Cabilao island, but had no luck (which means another short, deep dive with not much too see). The rest of the dives there were pretty great though. 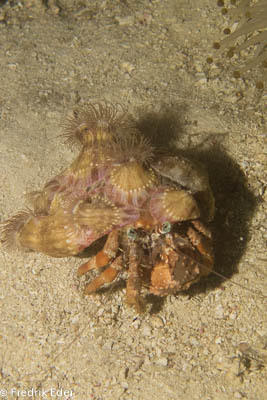 We saw 2 frog fish opening their mouths, and had an awesome night dive where we saw 2 squids, 1 small octopus, 1 big octopus, lots of different crabs, shrimps, stone fish, lion fish, scorpion fish, shaded batfish, nudibranchs, moray eels and catfish. When we got back to Cebu we were taken to a hotel close to the airport (Park Hill Hotel). We took a taxi to Cebu city to find some craft beer. We had done a lot of research, but couldn’t find most of the places on the list. 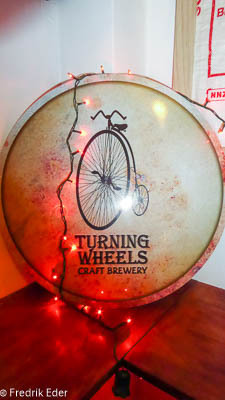 We had lunch and a couple of boring beers, and finally went to Turning wheels brewery when they opened at 6 pm. That saved the day! Awesome people and great beer. We tasted all the different types they had, and enjoyed a few more while talking to great people from all over the world. When they closed we went back to the hotel to pack for the flight to Kuala Lumpur early the next morning. We had a private car from Bongo Bongo to the ferry terminal, and had planned to have plenty of time there. That was a good idea, because we first needed to stand in one line to pay port tax, then in one to get our seats assigned and finally in one to check in our luggage. We had bought business class tickets, which meant that we got to sit on the upper deck in good seats with air condition, large windows and watch a movie. Two hours later (about 1 hour delayed) we arrived at the port in Tagbilaran. It took a while to get our bags, and we stopped by the ticket counter to buy tickets for the ferry back to Cebu in 3 days. We found a cheap tricycle to take us to our hotel in Alona Beach, Alona Kew Resort, which looks like a resort from the outside, but is quite basic and is located in the main beach road with short distance to everything. The best part was that we got a room in the garden, so we didn’t have any noise from either the main road or the beach. We had originally planned to spend 4 days in Bohol, but because of lost luggage, typhoon warnings and fully booked ferries, we only had 2 days here. Since the weather wasn’t great either, we decided to skip diving, relax and try to go through some photos and write a bit on our blog. The first evening we found a Belgian restaurant, with quite a few Belgian beers on the menu. We stopped by for at least one beer there every evening, and really enjoyed drinking something other than lagers all the time. Especially the slightly sour Rodenbach was perfect in the heat. Fredrik was told to be careful with too much sun for a couple of days, and also noticed that the rash got a lot better of the dry air condition air. So he stayed home going through photos, while Gunnhild went on a short sightseeing tour by tricycle. The first stop was the Blood Compact Monument, celebrating the March 1565 blood compact between Spain and the Philippines. Baclayon church was closed for visitors as it was still being rebuilt after the 2013 earthquake, but it was still interesting to see the coral-stone church from 1727 from the outside. Lunch was had at a very local fast food restaurant in Loboc, instead of on the tourist packed floating restaurants on the Loboc river. The final and most important stop was the Tarsier Sanctuary in Corella. Tarsiers are the world’s smallest primates, needs space, silence and gets easily stressed, so they had guides to take you around to make sure the tarsiers were not disturbed. It was a short 20 minute walk on muddy paths. Since the tarsiers are territorial, the guides knew where to find them, and 7-8 of them were easy to see from the path. They were very cute clinging to the trees looking at you with their large, sleepy eyes. In the evening we packed all we needed on the liveaboard in our backpacks and all the dive gear in one half of the suitcase, so it would be easy to take out. We had a couple of rum and coke in the room, got a good nights sleep, and took a car to the ferry terminal in the morning. This terminal was a lot more structured than the previous one, but it still took some time to get through all the lines. They had departure screens, loud speakers for announcements that was almost possible to hear and the ferry was less than 30 minutes delayed. Again we had business class tickets (only slightly more expensive than the other ones) and had a smooth 2 hour trip to Cebu. It was a 1,5-2 hour car ride from Moalboal to the port in Liloan (South Cebu), and after buying the tickets we waited for about half an hour for the ferry. It took just 20 minutes to get to Negros Island (Sibulan), and from there we took a tricycle through Dumaguete to our hostel/home stay/dive center in Dauin. It was quite a fun ride, with a lot to see on the way. We arrived at Bongo Bongo just before sunset, and were welcomed by owners, dive guides and guests. Such a friendly place. We had a private room in one of the bamboo huts on the property, but again spent most of our time in the common areas. One of the owners at Bongo Bongo is Danish, and quite a few of the guests and instructors/dive masters were Danish too. But this was also a popular place to stop by for expats from all over the world and quite a few locals. They had a shared kitchen for the guests, but we ordered from the nearby restaurant Cat’s instead, which delivered for free. Very good and quite cheap food. 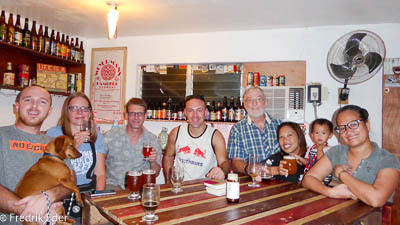 The hostel had a self-service bar with cheap beers, and the owner, Magnus, even managed to get us some craft beer from a Norwegian brewer in Dumaguete while we were there. We also shared some aquavit, but especially the Danes were not big fans. We spent most of the time between and after dives in the common area in the front. We played music, cards, games (tumbling towers was especially popular), learned Danish kids songs, shared info on places to stay/dive etc, cuddled the 5 house dogs and laughed a lot. 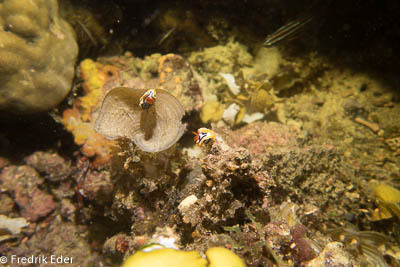 Dauin is famous for muck/macro diving. 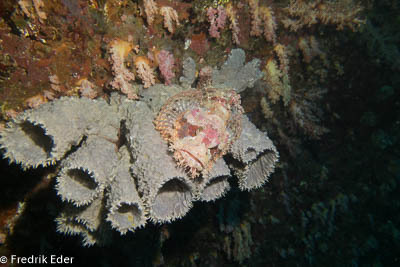 We had most of our dives with dive guide Marvin, who was excellent at spotting all kinds of marine life. We had a few dives just off the beach outside the hostel, but normally drove a few minutes along the coast in either direction. On Sunday we were supposed to go to Apo Island by boat, but the government issued a typhoon warning, and we were not allowed to go. We went by boat to other dive sites along the coast instead. Fredrik still needed to rent equipment, and this was a great place to do so. They had high quality gear, a lot of the same brands as our own gear. We finally found each other outside the airport in Cebu around 5 pm, both very tired, Fredrik with no suitcase and Gunnhild with a damaged one. We said goodbye to Fredrik’s new friend, Helle, and got into our pre-booked van. It turned out that it was the end of the holiday in the Philippines, so the traffic was terrible. The trip that should have taken 2,5 hours ended up taking 4. We had one short stop at a super market on the way, buying some basics (t-shirts, shorts, toothbrush, flip-flops etc) for Fredrik. Our hostel in Moalboal, Chief Mau, was very nice and just a few months old. We were welcomed by the staff who had received updates on Fredrik’s delays, and were very happy that we both finally arrived. We got a private room which was so new it was still lacking a few things (night lamp, mirror, hooks, curtains), but the beds were comfortable and the staff was very accommodating with whatever we needed. We didn’t spend much time in the room anyway, since the hostel had a great social area by the bar. They served basic but good food, had hammocks and other places to relax. Most people there were divers, so we had a lot to talk about. The hostel staff where amazing trying to track down Fredrik’s suitcase, and we left most of the communication to them. After a couple of days we got a message that it would arrive the next day, but it didn’t arrive to Cebu as expected, and we had to go shopping again. That was an interesting experience, since the local shopping center had different departments for everything, and we had to pay at different counters. Also it was completely impossible to understand the sizes, and all packs had to be opened to see if a shirt had long or short sleeves. After more than an hour we finally got out of there, with almost everything needed for the next few days (we gave up finding shaving cream and a couple of other things). After that we didn’t receive any useful updates about the suitcase at all. We did some laundry and extended our stay by one day, but had to give up in the end and plan our next stop. 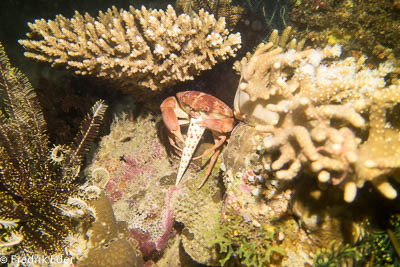 We had a total of 7 dives over 3 days with Cebu dive center, just down the road from our hostel. Fredrik had to rent gear since his was still stuck at an airport somewhere. 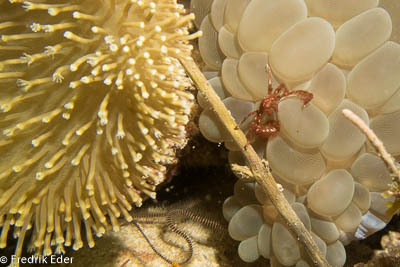 He was a bit unlucky with the regulator on the first dive, but after that there were no problems. Most dives were a short boat ride away, in their traditional bancas (double outrigger boats), but the house reef just outside the dive center was also a great dive site. We saw lots of frog fish, turtles, small moray eels and pipefish, a few sea snakes, octopus and leaf fish, several different nudibranchs and sea slugs (the electric one was pretty cool), reef fire gobies, flounders, scorpion fish and barracuda. We also got to see what Moalboal is famous for, the sardine run. We just noticed that it got dark, and when we looked up we saw a million sardines moving around, creating different shapes and forms. Pretty cool! The dive center had a bar, so we normally had a beer or two there after our last dive. We spent a long evening talking to an Irish couple there, and also some late evenings in our hostel. Especially our last evening got a bit later than planned. Everyone had trouble getting money from the local ATM, but one of Fredrik’s cards worked fine. We met a quite desperate Swedish girl there, who didn’t have any money at all. We ended up lending her 10000 PHP, and spent the evening (and most of the night) drinking beer with her, a Swiss guy and two Canadian brothers. Good times!